Throughout the spring, Lang’s First-Year Writing Program is hosting a series of weekly lunches where faculty (and some special guests) will present dynamic and interactive lessons in the craft of writing. These lunches will be held on Tuesday afternoons, 12:30-1:30, and are open to the entire New School community. Food from the stellar neighborhood restaurant Kubeh will be provided. Lunches will be held in room 510, 66 West 12th Street (except on Feb. 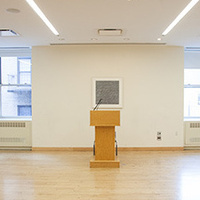 5!, when the talk will be in room 1103 of 6 East 16th Street). We in First-Year Writing, in the spirit of our colleagues across the University, hope these lunches can be opportunities to bring writing students and faculty together for both in-depth discussions of writing fundamentals and the more advanced lessons in what it takes to write convincing and arresting work. All are welcome. Write Scott Korb, Director of First-Year Writing, with any questions: korbs@newschool.edu.